You can't call it a great restaurant by any definition. However, if you care for some good fresh Chinese, Indian or Tibetan food that are really cheap, then Dafey Munal can be a nice choice. It's located right on the Taxi stand of Laden-La road and near the junction of Gandhi Road. The restaurant is virtually hidden behind the taxis parked right in front of it. Unless you look carefully, you can easily miss it. You will literally have to walk in-between the taxis to get to the entrance of Dafey Munal. But once inside, it's a nice casual restaurant that has some six tables, each seating four persons. 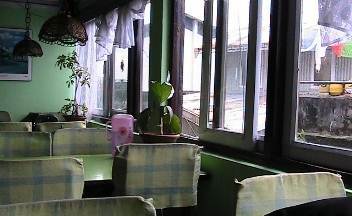 It's an old low scale restaurant and often frequented by foreigners. The restaurant serves Chinese, Tibetan and Indian food. 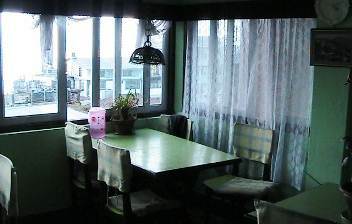 There are three tables along the window side. My favorite is the one at the corner from where the view outside is the best. This is a vantage point from where you can see all the activities inside while watching the great views of the mountains outside. However, the view is somewhat restricted by the tinned roofs of the residential buildings right next to the restaurant. Just overlook that, and you can still enjoy the views. As you walk in, on the right side of the entrance there is a small section with internet access. So the restaurant also doubles up as an Internet cafe with three flat screen PCs and the rates are quite reasonable too.The inside ambience is cozy and casual. The wall to the right of the entrance has many picture posters including that of the Himalayan range. The walls and the table tops are green in color giving an overall greenish hue inside. However, you can notice that the restaurant is aging a bit. Some of the chair covers are faded and torn, and not yet replaced. Having said that, the restaurant is overall quite clean and there is enough elbowroom and leg space here unlike many other small restaurants in Darjeeling. Coming to food, there are many items in Chinese, Indian and Tibetan. For lunch or dinner, you can start with an interesting soup like chicken meat ball soup, egg soup or chicken mancho soup. For main courses in Chinese you can go for chicken, mixed or veg fried rice or chowmeins along with side dishes. 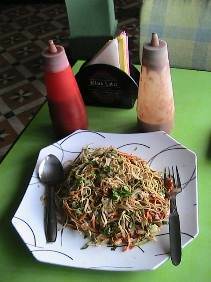 I had tried the chicken hakka chowmein here for lunch. Although a little oily, it was quite tasty though. They serve thin chowmeins here which elsewhere are usually called lowmeins. The quantity or the portions are moderate. I wish they had given some more chicken in the dish. However I was quite satisfied with the overall preparation. In Chinese you will also get Chicken, American, Mixed and Vegetable Chopsueys and different side dishes in chicken, vegetable and pork. You get some good Indian dishes as well like tarka, Indian curries like egg, chicken and pork curries, paneer (cottage cheese) preparations etc. You can have choice of salads like normal green salad, crispy Chinese salad, Russian salad and fruit salad. They also serve lassi and milk shakes of various types. My favorites are the banana lassi and the chocolate milk shake. Dafey Munal is actually most well known here for the delicious momos (dumplings with fillings) they prepare - both steamed and the fried ones. They prepare in limited quantities and often gets finished. You will need to come early for these. Other than lunch and dinner, Dafey Munal also serves breakfast. You will get aloo puri, chicken and pork sandwiches, toast & butter, eggs, pan cakes, bacon etc. But few of the interesting breakfast items here are the porridge with banana and Tibetan bread with butter. They also serve tea and coffee. The service here is quite good and friendly. Yashik, a smiling young Nepali lad is working here for over three years and will help you with whatever assistance you need in selecting the food. Note that from outside there is a big 'Bar' sign next to the board of Dafey Munal. There is a separate bar (different owner altogether) upstairs and the restaurant has nothing to do with that. Dafey Munal does not serve any alcoholic beverages. 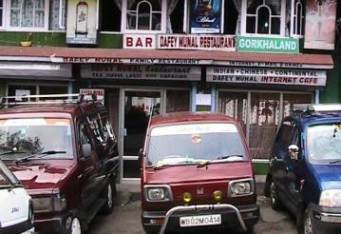 Dafey Munal Restaurant is located on Laden-La Road and right behind the Taxi Stand. From the Gandhi Road police point (the junction of Gandhi rd, Nehru Rd and Laden-La rd), it is just a few steps along Laden-la road and on the right.